Having a properly-equipped tackle box is essential for every fisherman, be him a beginner or already a pro. Hooks, lures, lines – all these, among others, have to be stored for a successful fishing trip. If you’re on the hunt for the best fishing tackle box, bear with us, and you’ll get it! What Are the Different Types of Tackle Boxes? The most corpulent, but concomitantly the largest tackle boxes. These are usually made with hard plastic, therefore are quite heavy and they seem to have started losing ground in favor of soft boxes/bags. Anyway, if you need a lot of storage space for your tackle and you don’t mind the extra weight, you should consider a solid box. Manufacturers have seen the potential of the classic life jacket as a storage space and acted immediately. Nowadays, you can find a life jacket with so many pockets that you wouldn’t really need any other box. Of course, it depends on how comfortable it is, given that it can be quite large. Anglers can make the best out of a pocketed life jacket. Take a lot at some of the best on the market. A tackle bag is a very good choice if the trunk of your car cannot fit a solid tackle box. Moreover, it won’t weigh down your kayak as much as the latter does. To some extent, a tackle bag can be much more spacious than a solid box. You can cram things in it, and the material just keeps on expanding. Needless to say, that doesn’t happen with a hard-plastic unit. The choice is ultimately yours. “Whatever floats your boat” was never as suitable a saying as in this circumstance. If you’re having a ton of tackle, it simply will not do to buy a small bag. Don’t judge a box/bag by its appearance. What looks like it’s not too spacious might genuinely amaze you. Always check the number of compartments. If you’re going for a tackle bag, make sure it’s waterproof. The solid tackle boxes are not, most of the times, but are watertight (not the same thing). Extremely important. You simply can’t get a box that will sink your kayak, can you? Storage capability and weight are commonly interconnected, so make sure you don’t get something that will have no practical use. We’ve always said it: a cosmic price does not necessarily get you high quality. It’s got to be somewhere in the middle. You can pay $100 for a box, for instance, only to find out it is worse than your tattered $20 bag. The best fishing tackle box doesn’t have to cost more than $100 to be effective, so don’t flush your money down the drain. Can I Hack a Tackle Box? 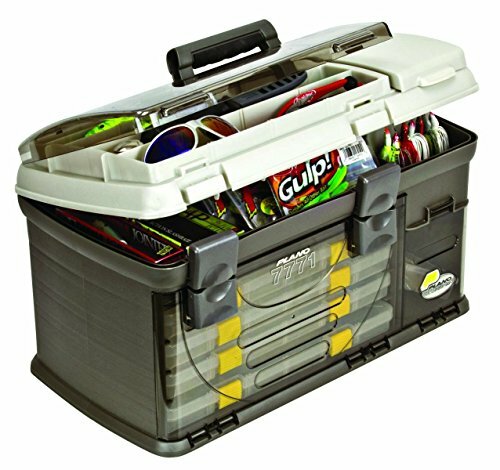 We all know that tackle boxes, as great as they might be in general, can and will turn your order into disarray. You can use magnets, like in the video, for example, to keep hooks in the same place, no matter how agitated the waters you fish on might be. 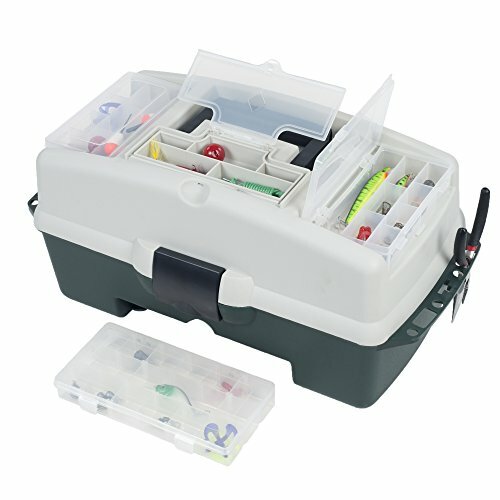 What Brand of Tackle Box Should I Get? This is something that each fisherman decides for himself, but because we want to have you covered on all topics that might interest you, we ought to mention that the highest-rated brands at the moment are: Wakeman, Plano and Ready 2 Fish. Obviously, this is not to say that other brands are awful. It can so happen that you’ve had only one brand of tackle box your entire life. You shouldn’t get another bag just because somebody tells you to. If it served you well for years, the chances are that it will still do half a decade from now. As long as the tackle box is as spacious and well-made as you wanted it to be, it can be any brand, be it known or obscure. Just make sure you don’t end up with a product that you’ll have to return to the seller because you can’t even use it properly. No-name brands are a little weak regarding quality, so keep that in mind. We’ll present you a couple of great tackle boxes in the following section, so you get some options if you’re about to buy your very first box. Should I Buy It with or Without Tackle? If you’re a beginner, we recommend you get a tackle box that was equipped beforehand. This way, you’ll get a chance to see what the vital items in it are. Afterward, you’ll be able to come up with your own equipment. As you might expect, a tackle box that was filled with all the tools and accessories you need when fishing is considerably more expensive than it would’ve been if it were empty. Every fisherman has grown fond of particular items, that’s why professionals usually go for empty tackle boxes so that they can put their favorite accessories in it. If you feel like you know everything about tackle, you can surely get an empty one. If your knowledge on this is somewhat scant, purchase a box that has the right amount of tackle, then keep on updating it as you become more and more of a professional fisherman. Now that we’ve answered some of the most common questions in regards to the much-needed tackle box, it’s time to review 5 of the best products you can find on the market at the moment. Equipped with three utility boxes + quadruple side storage, the Plano 728 is among the largest and most spacious tackle boxes you can get. 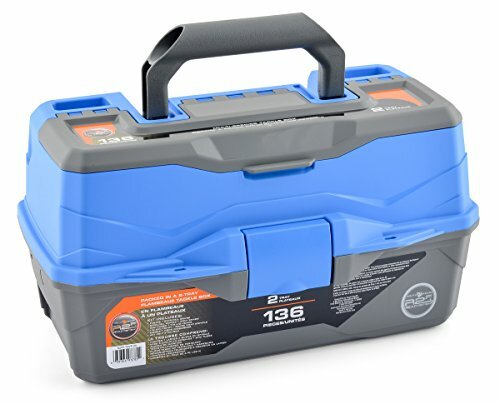 The sturdy construction and the 150 display of the utility boxes also recommend this as the best tackle fishing box you can grab with minimal investment. Even though most units that are this big are usually heavy, this weighs 6.4 pounds. It will make a difference in a kayak. By the way, it also has a large storage space under the top lid, not only on the sides. It’s less likely that there won’t be room for all your tackle, no matter how much of it you have. 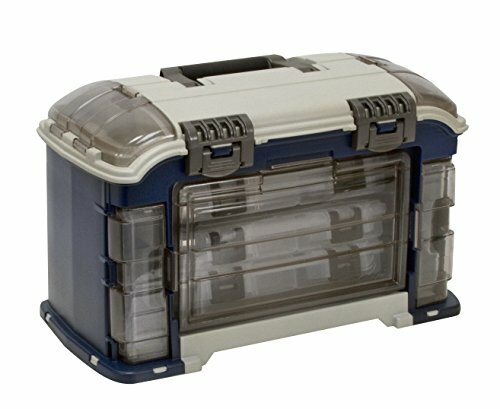 If you’re a fan of large, hard-plastic tackle boxes, then this is, without a doubt, the best choice you can make. Highly recommended by both ourselves and hundreds of pleased customers. This differs from its aforementioned brother because it provides more bulk storage instead of an organized-type one, even though it’s got four utility boxes. The top lid has 14 tiny dividers you can use for small accessories like hooks, string, lures, some extra line, etc. The inside of the top lid provides enough space for approximately three medium-sized boxes. As you can see, the storage volume on this is huge. Be careful, though, because since it has so much space, it can become pretty heavy. That’s not a problem when you’re used to carrying a lot of tackle, but it could be for someone who just got into fishing. There have been a few minor complaints in regards to the top lid – it looks like it latches only when it wants to. That’s probably because the transporter was reckless. Hopefully, yours will get to you without any defect whatsoever. The first two reviews were for tackle boxes meant for professionals. The R2F, however, is the best fishing tackle box for beginners. This is a small, handheld box with minimal equipment in it, but it will serve you well if you get it as a rookie. It comes with a few hooks of various sizes, some line and a couple of lures. This would make a great present for a child that shows an active interest in fishing. Due to being so small, it is also super-light, which means a kid can carry it around without a problem. This is not recommended for professional fishermen. It’s too tiny, and the storage space is consequently small. Although it looks like a toy, it’s quite helpful, even for adults. Suppose you went on a casual fishing trip on a lake – you can take just the essential tackle with you. 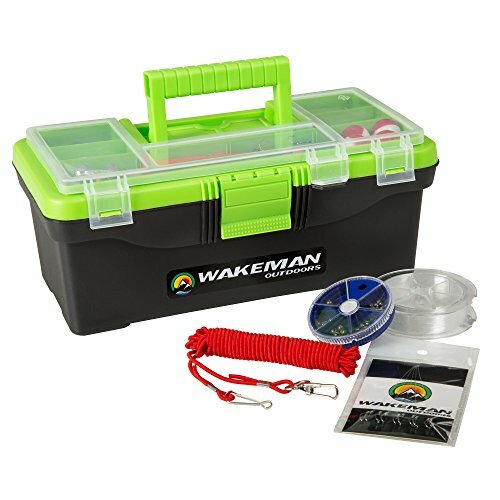 Regarding size, Wakeman’s box is similar to the Ready 2 Fish. However, it provides a little more storage space. What makes this a great purchase is the fact that it is already equipped with a large array of accessories, from hooks to baits and sinkers. The first storage space is on the lid and is separated with dividers, which will come in handy when you can’t seem to keep your hooks apart. The second space is just underneath that. One of the reasons why you should consider purchasing this is that you can save some money on accessories. Don’t be greedy, though. Because it is fairly cheap, so are all those things. Again, beginners could make the best of it, but the pros wouldn’t even look at it without scoffing. All in all, it’s a good tackle box, but somewhat cheaply made. And that shows both in appearance and equipment. The last product we’ll review here offers plenty of storage for all your tools. In total, this Wakeman has around 30 compartments that can be filled with all sorts of tackle. A nice addition to this particular model is represented by the tool holders on the sides. Those can accommodate knives, pliers and anything else you might take with you whenever you go fishing. You also get easy access to all your tackle, especially the one you put in the compartments on the lid. The largest compartment is under the mid-lid. It’s quite spacious, considering that you won’t be paying that much money on this box. Although this item is not as popular as the ones above, we are sure that it will become quite trendy in a few years. It might be in the last place, but this is by no means a tackle box we’d throw away. Your tackle box is your best friend when you're out there on the water. It's going to hold everything you need to land some monsters. When looking for a tackle box make sure to get one with enough storage for you, but that is also water proof and lite. A heavy tackle box is going to make it difficult to fish a bunch of different spots. If you have your own lures and hooks already, then there's no need to pay more for a tackle box loaded with lures that are usually not very good anyways. What do you think is the best fishing tackle box? Let us know in the comments below!